Fixture Templates allow organisations to create a template by which their fixturing is then done. This allows them to set up a template that creates the fixtures based upon the teams' seedings and automatically create the required fixture for the competition. 1. Within the Management Console, select Competitions from the top menu, then Fixture Templates from the left menu. 2. Click on Add at the top of the page. 3. Give the template a Title, as well as listing how many rounds are required, and how many games per round, then click Save. 4. Click Matches at the top of the page. 5. Click on Edit Round next to the first fixture of each round. 6. Drag and drop the Seeds into the Matches table to create the fixtures. This will populate all matches in this round. 7. Click Save to save your changes and then complete this process for any remaining rounds. 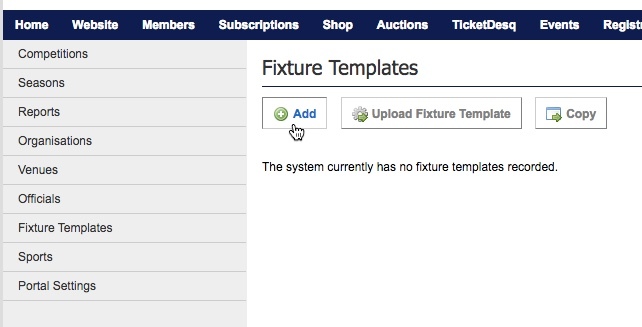 Fixture Templates create an easy way for organisations to do their fixturing for each season. Setting up Fixture Templates for each of your standard competitions, allows you to use these time after time, and save administrators valuable time when doing fixturing.